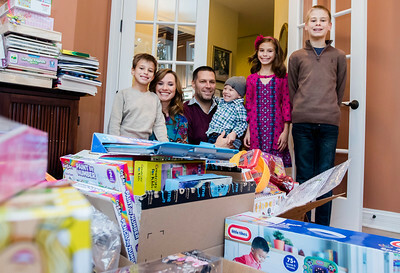 Sarah Nader - snader@shawmedia.com The Younge family, Braedon (left), 6, Shelby, Bryan, Hudson , 3, Avery, 9, and Evan,12, pose for a portrait at their Lakewood home with some of the toys they collected for the Pediatric Oncology Treasure Chest Foundation Thursday, Nov. 9, 2017. 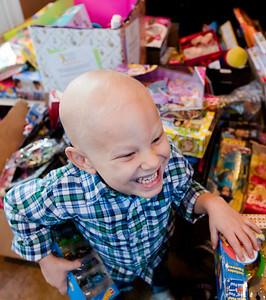 The foundation exists to help make kids with cancer smile after a rough treatment. They put a bin outside their garage and at St. Thomas the Apostle School in Crystal Lake to collect toys. 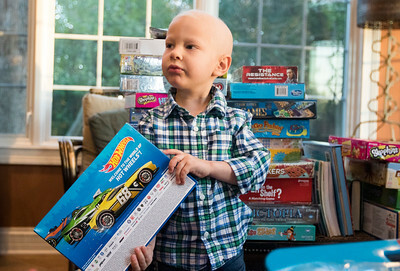 Sarah Nader - snader@shawmedia.com Hudson Younge, 3, of Lakewood looks at some of the toys his family has helped collect for the Pediatric Oncology Treasure Chest Foundation Thursday, Nov. 9, 2017. The family became involved with the foundation after Younge was diagnosed with Leukemia earlier this year. Sarah Nader - snader@shawmedia.com A view of some of the toys the Younge family collected for the Pediatric Oncology Treasure Chest Foundation Thursday, Nov. 9, 2017. The foundation exists to help make kids with cancer smile after a rough treatment. 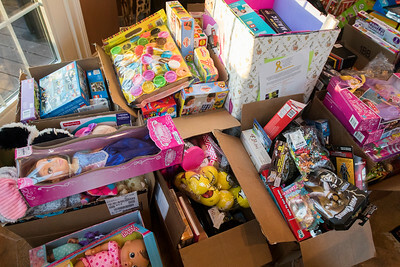 They put a bin outside their garage and at St. Thomas the Apostle School in Crystal Lake to collect toys. Hudson Younge, 3, of Lakewood looks at some of the toys his family has helped collect for the Pediatric Oncology Treasure Chest Foundation Thursday, Nov. 9, 2017. The family became involved with the foundation after Younge was diagnosed with Leukemia earlier this year.